You may have heard that the Appalachian Trail takes 5,000,000 (that's 5 million) steps to thru-hike. Well, my legs are longer than most, so I thought it would be fun to find out exactly how many Hiking Dude steps it takes to thru-hike the scenic trails. After I've hiked a trail, I'll post my step count on the informational page for that trail. Last month, I started looking around for a good pedometer to take on my hikes. At just the perfect time, an opportunity to test a new GeoPal pedometer came up at OBN and I got chosen as a participant. So, I've been wearing a GeoPal on my hikes for the past week or so to see if it does what I need. I just clip it on my shoelace and walk - pretty simple. When I get home, I look at the number of steps displayed. It's a very cool little gadget, doing more than just count my steps - which it does very well. It's an accelerometer pedometer which is better than pendulum design. It has the date and time so I don't really need a watch. It stores 21 days of data, automatically starting a new day of steps at midnight. 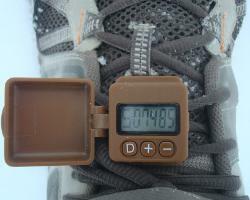 You can wear it on your wrist, hip, or shoe - I use the shoe so it's out of the way and more accurate. The market for GeoPalz is youth, with a goal of increasing physical activity levels by making running around rewarding. To reach this goal, they've created a fun website called GeoPalz.com where kids can track their steps and earn stuff, ranging from frisbees to gift cards - I've already got almost enough steps for a sports bottle! Each person can set up their step length, height, weight, age, and other details to accurately track miles walked and calories burned. That's probably more interesting to parents or someone on a fitness program. My favorite part of the GeoPalz website is a map that automatically shows how far you walked, from your hometown to neighboring towns. As your accumulated miles grow, you reach distant towns. Since GeoPalz are aimed at youth, the pedometers have tons of different emblems from which to choose to make them more personal, from butterflies to skateboards. In my case, I didn't really want to walk aroud with a flower on my foot, so I trimmed off the soft plastic piece, reducing the weight of the device as well - it's just 0.6oz now. It has a very strong clip and dust/water cover that I could remove and probably drop it to 0.3oz but I'm not that much of a gram weenie. I plan to keep tracking my training hikes and then wear my GeoPal across Arizona in the spring. I'll let you know how many steps it is from Mexico to Utah, and other trails after that.